Kindle Fire is a tablet computer manufactured by Amazon.com for e-book readers. It’s official announcement date was on September 28, 2011 and released in a 7-inch display on November 15, 2011. It supports multi-touching with IPS Technology and runs a forked version of Google’s Android operating system. It is, however, the same as iPad. Kindle Fire is designed for audio-visual media including books, periodicals, movies, music, games, apps and web content. It is powered by a 1 GHz Dual-core Cortex-A9 processor and PowerVR SGX540 GPU. Unlike with iPad and Nexus 7, Kindle Fire does not have camera. 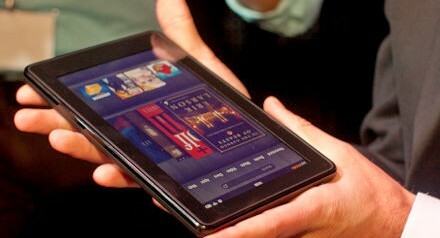 Kindle Fire can be bought in Amazon for $199 just the same as the Nexus 7 and Barnes & Noble’s Nook tablet.